When cooking chicken, make sure to cook thoroughly, so there is no pink and the flesh is opaque all the way through. 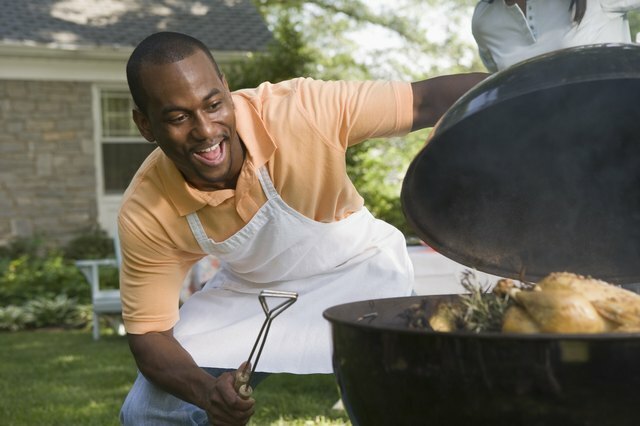 If you are using a meat thermometer, you can use it to determine when the meat is done; chicken should be cooked to 165 degrees. If you are roasting a whole chicken at 350 degrees in the oven, it should take about 75 to 90 minutes for a 3- to 4-pound chicken to cook thoroughly and closer to 2 hours to 2 hours and 15 minutes for a 5- to 7-pound chicken. If you are cooking the chicken in the oven with an oven bag, this should cut the time down to 60 to 75 minutes for a 3 to 4-pound chicken, or 75 to 90 minutes for a 5- to 7-pound chicken. For a stewed chicken, cook the bird for 60 to 75 minutes for a 3- to 4-pound chicken or 1 hour and 45 minutes to 2 hours for a larger bird, 5 to 7 pounds. 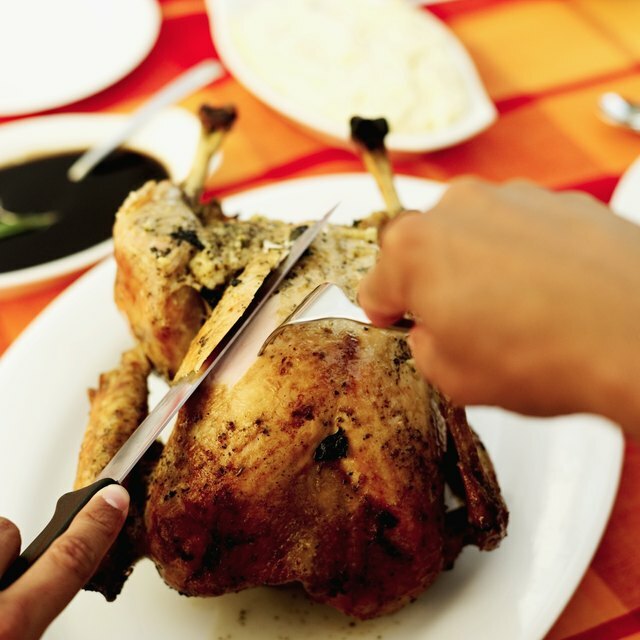 If you are grilling a whole chicken, it should take 60 to 75 minutes for a smaller, 3- to 4-pound bird, or 18 to 25 minutes per pound for a larger bird. If you are cooking just chickens legs or thighs, then you can follow the following cook times for a 350-degree oven. 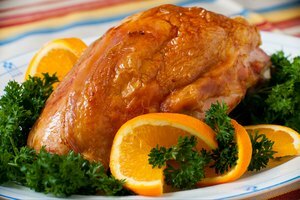 For roasting in the oven, legs and thighs can be cooked for 30 to 45 minutes, less for drumsticks, more for larger thighs. Wings can be roasted for 30 to 40 minutes. If you decide to stew the legs and thighs, this should take about 40 to 50 minutes, or 35 to 45 for wings. 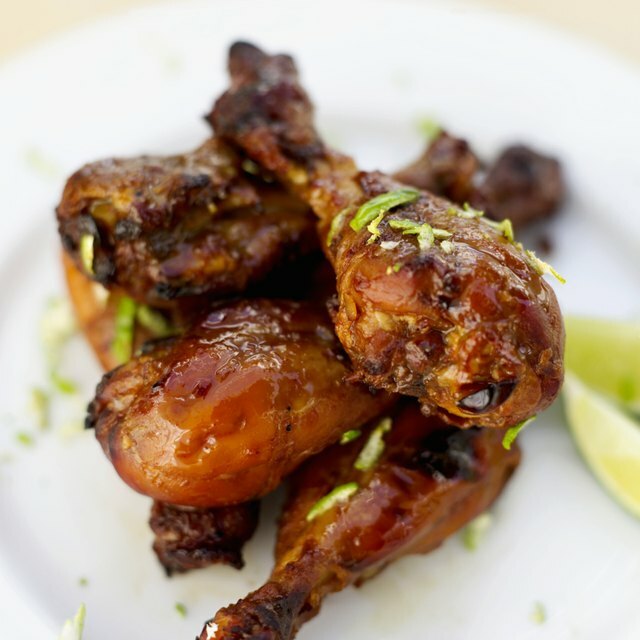 For grilling, chicken legs and thighs should take about 10 to 15 minutes per side, and drumsticks and wings should take 8 to 12 minutes per side. For oven bag cooking, thighs should take 25 to 40 minutes, drumsticks in 40 to 45 minutes. For cooking chicken breasts, the following times are appropriate in a 350-degree oven. 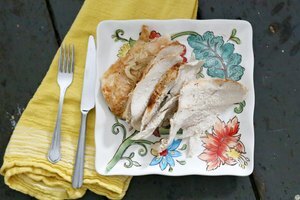 When roasting bone-in chicken breasts, they should be fully cooked in 30 to 40 minutes, while boneless breasts will be done in 20 to 30 minutes. 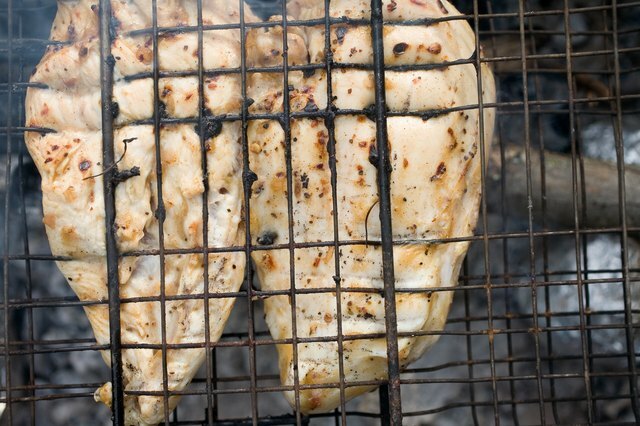 Bone-in chicken breasts can be stewed for 35 to 45 minutes and boneless breasts for 25 to 30 minutes. If you decide to grill your chicken breasts, they should be done in 10 to 15 minutes per side for bone-in, and 6 to 8 minutes for boneless. 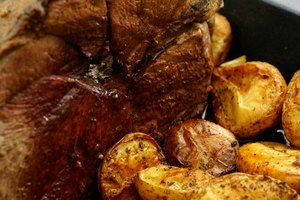 If you use an oven bag, the bone-in breasts should cook for 40 to 45 minutes, and boneless breasts in 25 to 30 minutes. Maggie Mertens is a freelance writer currently located in Washington, D.C. She has written for numerous media outlets since 2006. Her work has appeared in publications such as the NPR Health Blog, Seattle Weekly, the San Diego Reader and the Daily Hampshire Gazette. She earned her Bachelor of Arts in English and Italian studies from Smith College in Northampton, MA.